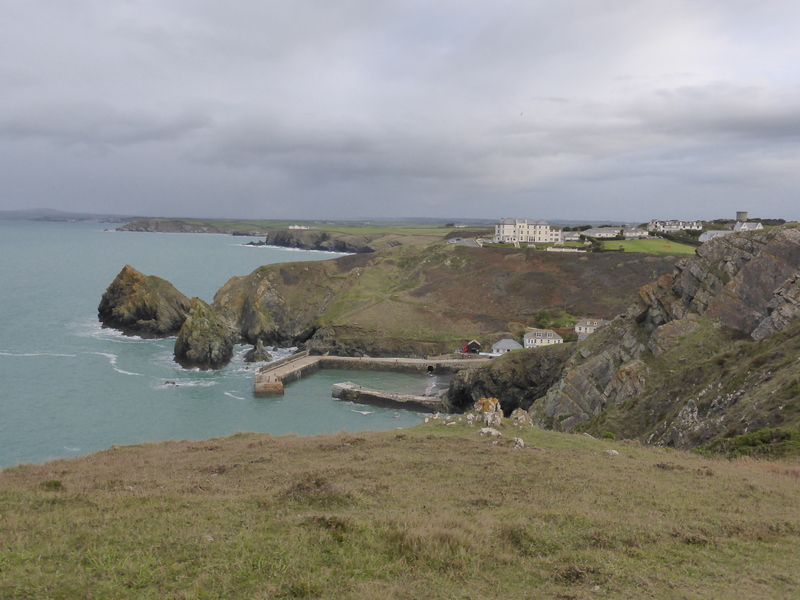 October 24-26 – To celebrate my birthday, my husband Brian booked us into a gorgeous cliff top hotel by Mullion Cove in West Cornwall for a long weekend. We left home on a Friday morning and travelled there by car from Dorset. It took us about 4 hours to get there, we crossed the County of Devon and arrived at North Cornwall, Truro (only city in Cornwall) in time for lunch at the lovely Blue Bar Restaurant, nicely placed at a horse shoe shaped cove. 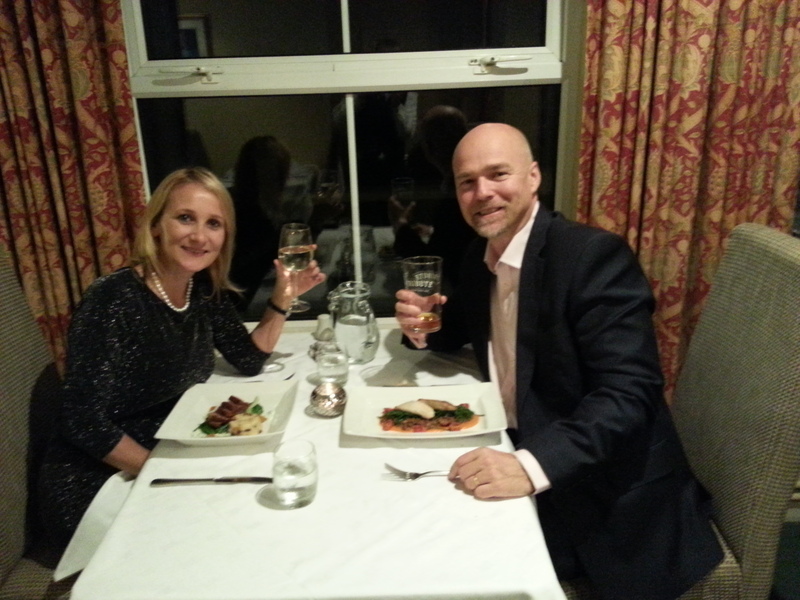 It was raining and cold and so we decided to quickly get inside for our meal, managing to get seated at an alcove with a great big window looking out to sea. 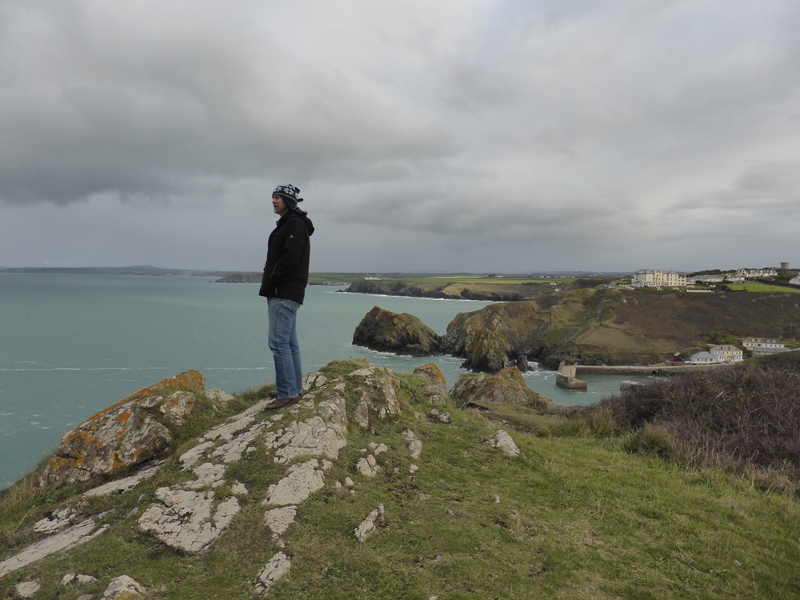 After lunch, the rain had eased a little, so we managed a very short walk around the nice cove, there were some other people braving the wind and cold to walk their dogs. Afterwards we got back into our warm car and drove across into South Cornwall towards our hotel in Mullion Cove, past the chocolate factory and the 15th century church of St. Mellanus. Cornwall is a peninsula bordered to the North and West by the Celtic Sea, South by the English Channel and East by the County of Devon, so you are never far from the sea, and some breathtaking coastline. This region is dominated by the Peninsulas of Penwith in the Westernmost part of the UK, also known as Lands End and the Lizard at the most Southerly point in the UK. It is a rugged coast line of dark rock, moorland landscapes, high cliffs, little coves and fishing villages that feel like stepping back in time. 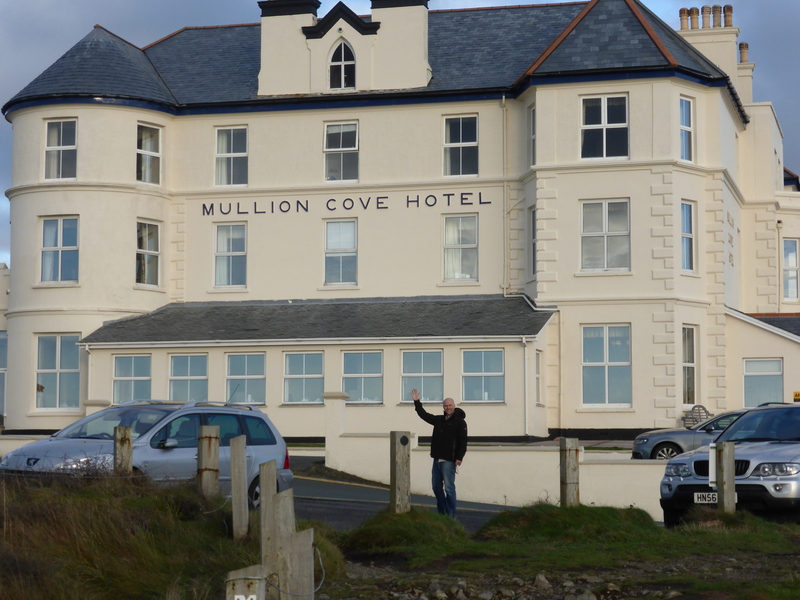 We arrived at the Mullion Cove Hotel in the afternoon, and were shown to our room overlooking the Cove. 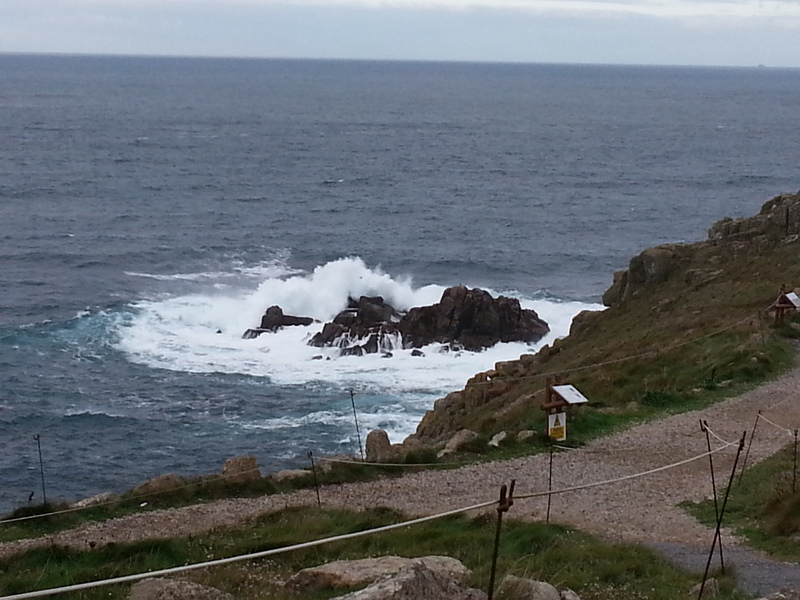 The dramatic Atlantic waves were crashing into the man made walls that protect the harbour. From my bed I had the most fantastic views and could not feel more lucky and privileged to wake up to this picture perfect scenery every morning. I was absolutely loving my birthday surprise. 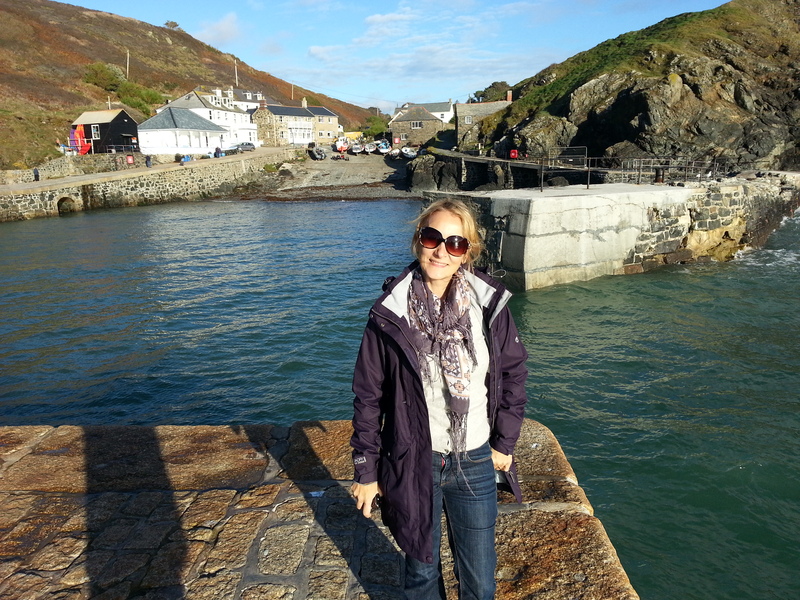 Soon after dropping our bags off at the hotel we walked down to the Mullion Cove harbour, following a little path. The path starts just outside the hotel; it was a little steep and it took us down towards the sea. The rain had stopped and it was a pleasant evening with mild temperatures and a lovely sunset. We walked along the wall and Brian chatted to a fisherman, who was trying his luck, but not catching much at that time of the day. That night we had dinner at the hotel, which was to be my birthday dinner. The food was delicious and the service was very friendly, and we sat by the window with the twinkling of boat lights in the distance. 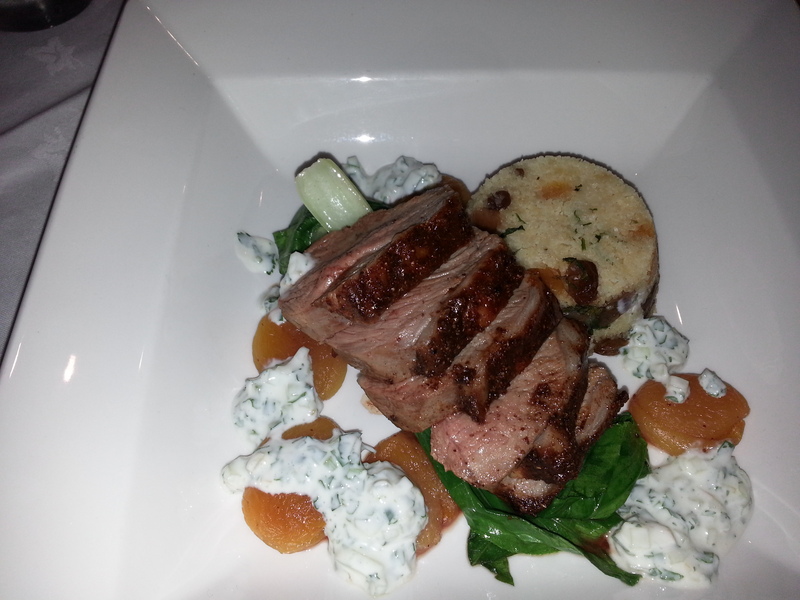 The delicious food and the relaxed atmosphere made it very enjoyable, so much so that we decided that we would eat there again on Saturday night. The Southwest Coastal Path is rated (by Lonely Planet) as one of the most scenic and beautiful walks to be found anywhere in the world, and has about 630 miles of gorgeous coastline, showcasing great scenery, wildlife, dramatic and unusual geology and British Heritage. The route starts at Minehead (Somerset) on the edge of Exmoor , runs down the North coast of Devon and Cornwall to Lands End, then along the South coast bringing you to Dorset and not far from our home in Poole. We have vowed that one day we will walk the whole length of it. 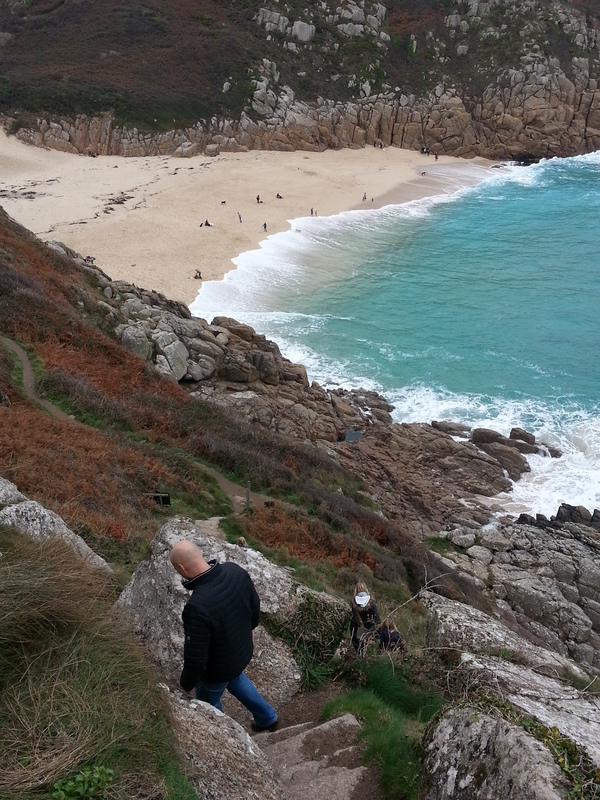 On Saturday morning after breakfast, we left the hotel by foot to walk a small length of the Coastal Path. The route took us along a flat-topped plateau with the occasional descending into the picturesque coves and fishing villages. The landscape is mostly heather type vegetation, and with very few trees, since this is a very exposed and harsh environment, and trees don’t really thrive well. 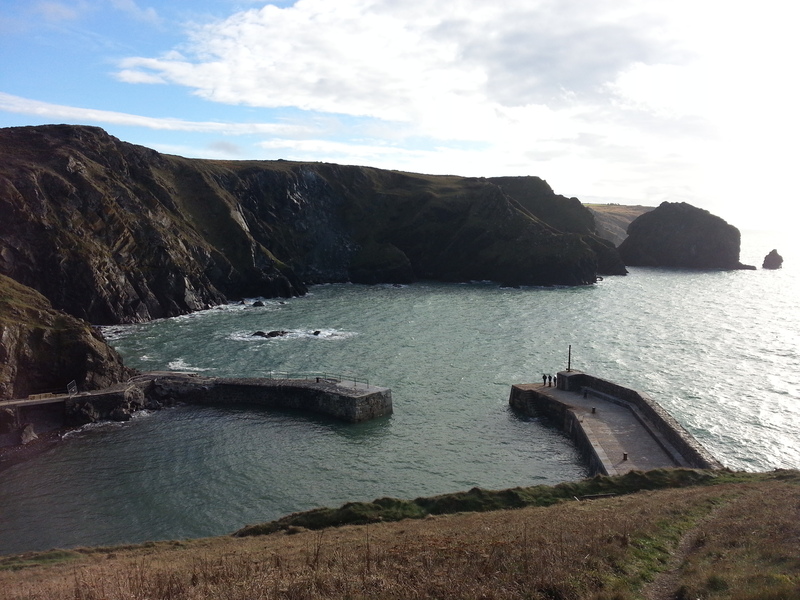 From Mullion Cove harbour we climbed up the cliffs and then along the flat bit at the top towards Kynance Cove. The landscape was gorgeous and we saw many rare and beautiful birds such as the peregrine falcon, ravens, and plenty of seagulls gliding up and down with the wind. This place is a haven for many sea birds with the island formed of lava, so many rocks, nooks and crannies to hide and nest. 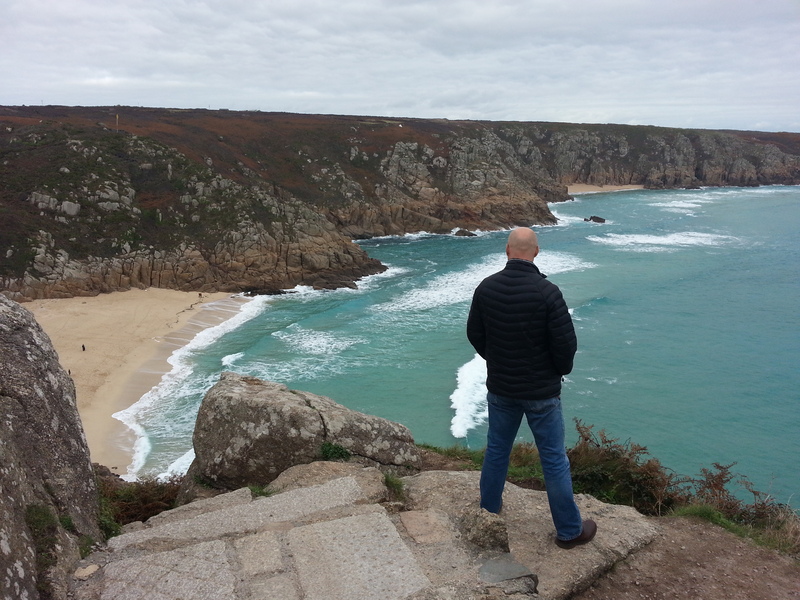 Unfortunately we only had time to do a small section of the Coastal Path, since we also wanted to visit few other attractions in West Cornwall, but we loved it so much that we will definitely come back to do more. 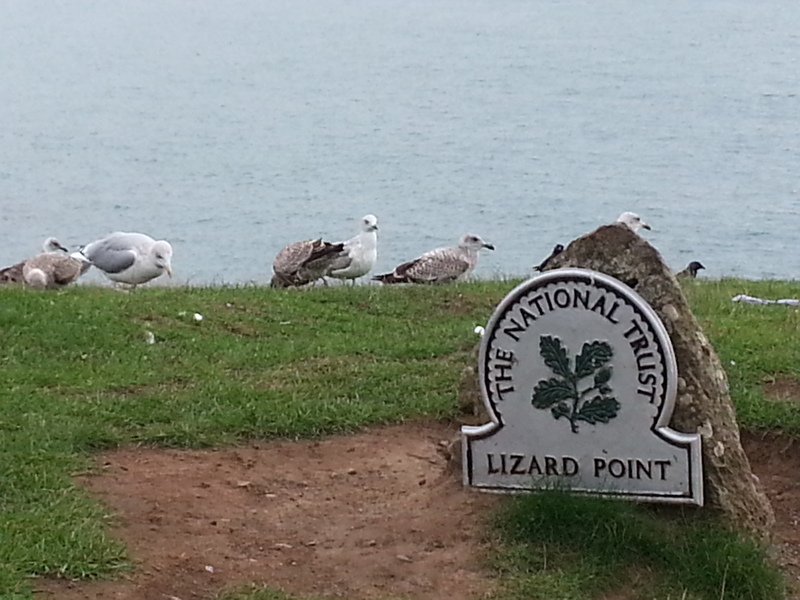 The little town of Marazion is the gateway to access this iconic Mount. A Causeway that is usually hidden by the sea, becomes visible at low tide and it is the only way of accessing the castle by foot. 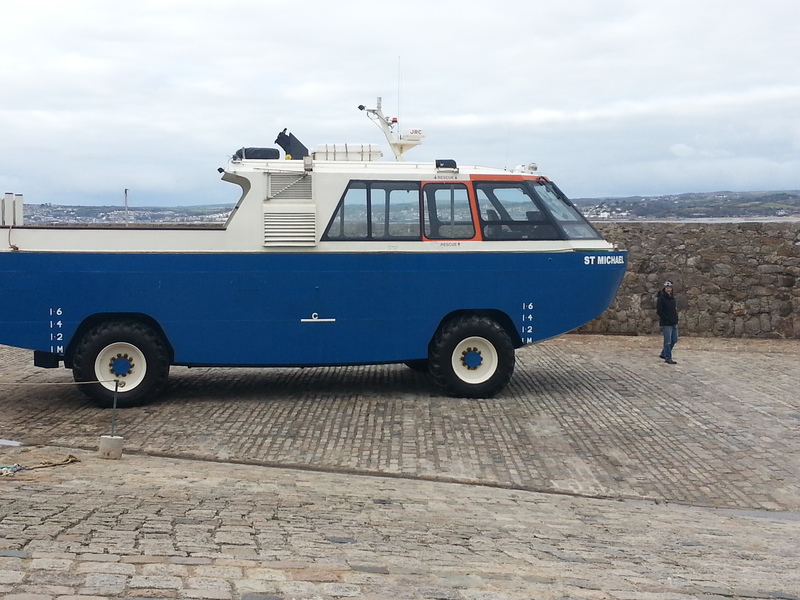 Of course it can also be accessed by boat (although on this occasion the boats were not transporting people, as the Castle is closed on Saturdays). We timed it perfectly with the low tide and managed to walk across, although we could not enter the castle we loved walking around the little island. 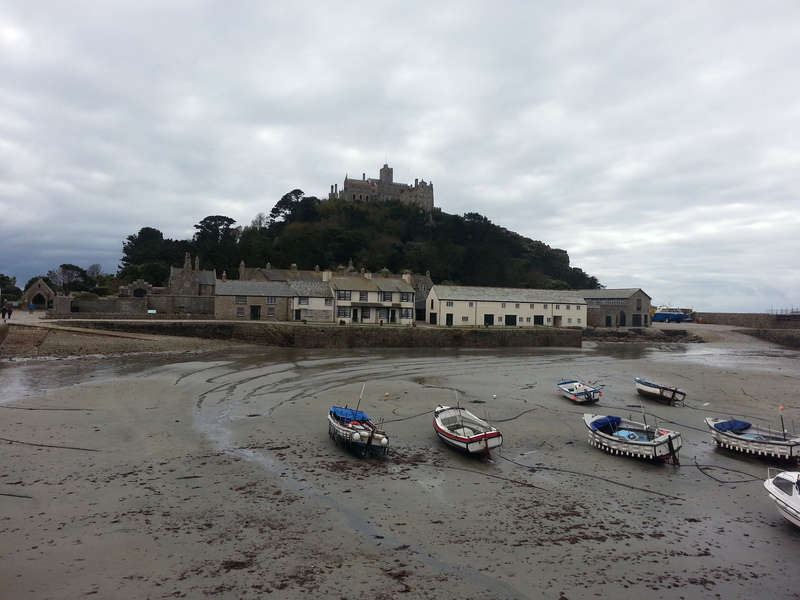 Low tide, allowing us to walk the half mile or so across to the lovely Mount. All this walking and fresh air opened our appetite and since it was lunch time already we decided to stop at a nearby café for a Cornish Pasty. 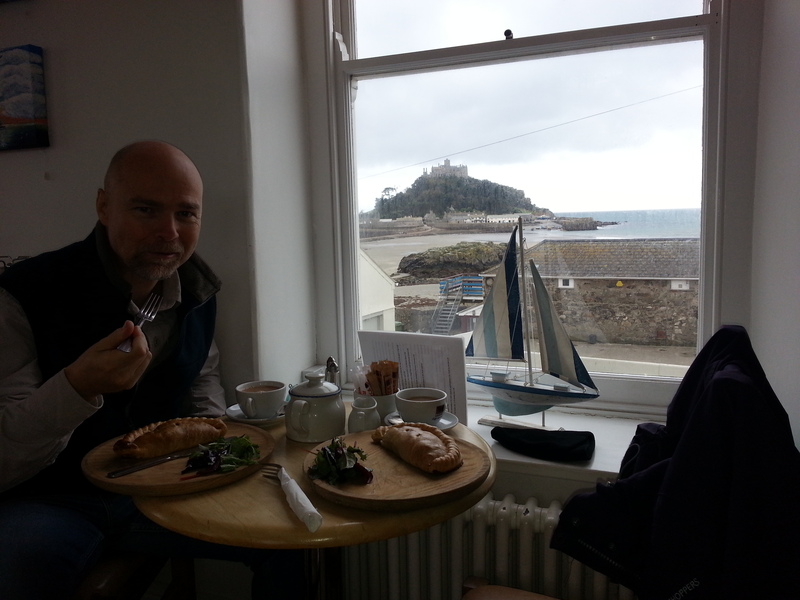 We found a table by the window with a lovely view of St. Michaels Mount in the distance. The Cornish Pasty is a savoury dish made with a filling of beef steak, onions, potatoes and swede encased in a lovely pastry. Locally the pasty is know as “oggies”, Cornish Pasties historically have a variety of fillings and flavours and are very traditional of this area. One of the great benefits of coming out of season is you can enjoy all the local attractions and facilities without having to queue. I can imagine this place being completely mobbed in the Summer, and so many of the roads date back to horse and cart days and would jam up with lots of traffic – not to mention the lack of parking in tiny seaside towns jammed between sea and cliff! 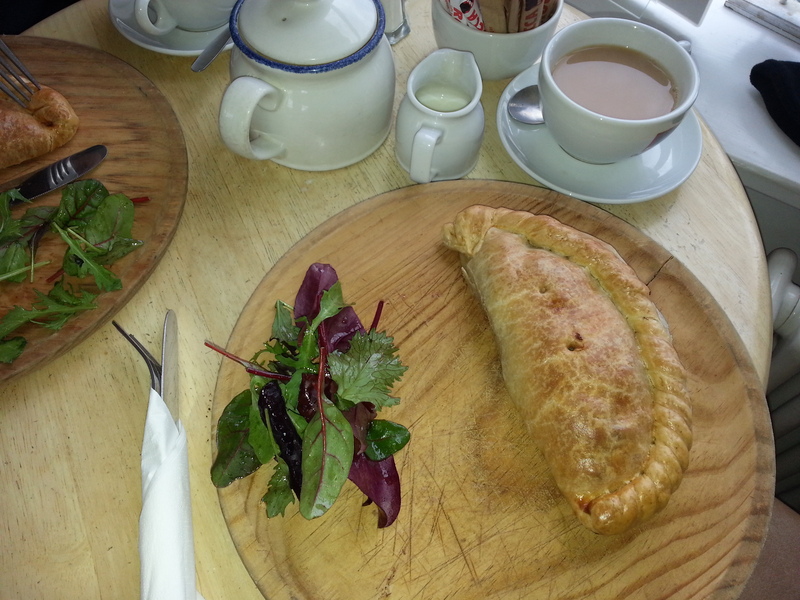 Cornish Pasty and tea – perfect! 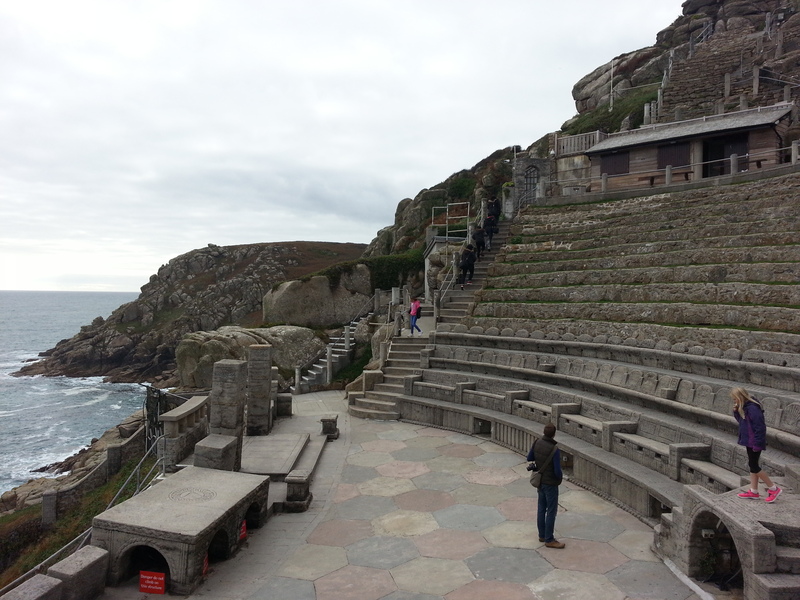 After a good rest we were ready for our next stop, the amazing Minack Theatre. 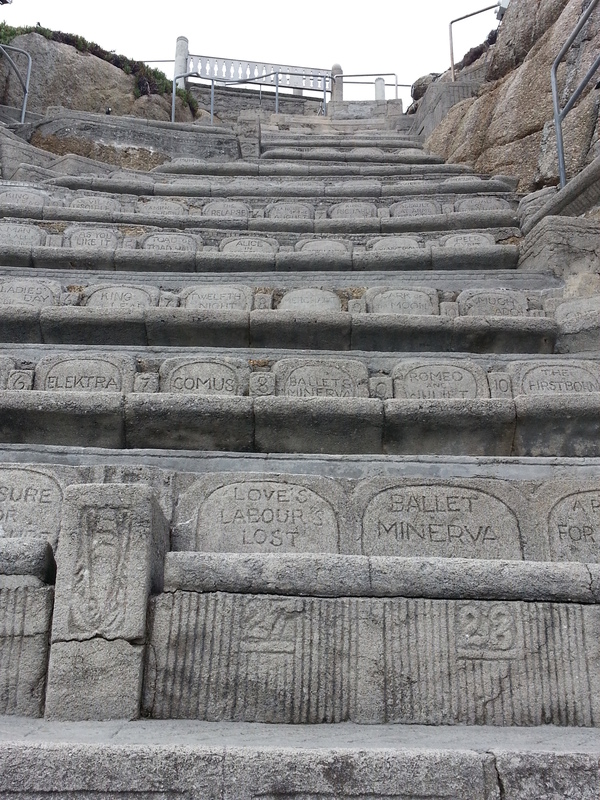 The vision on an amazing woman, Rowena Cave, the Minack Theatre is a theatre like no other. Constructed on the side of a cliff with amazing sea views it is an outdoor theatre perched precariously on the cliffs of Porthcumo. It showcases live plays by Shakespeare and also musicals and plays by other play writers. It was such a shame that we could not watch a play (season of plays and musicals is from May to September) as it would have been amazing, although I imagine you would need to take warm clothes and a blanket to be sitting for a good 2 to 3 hours watching a play at this open air theatre – but it would be magical. We walked around in awe (it deserves a big WOW! ), the amount of work and years of Rowena’s life dedicated to this incredible project is truly an inspiring legacy. 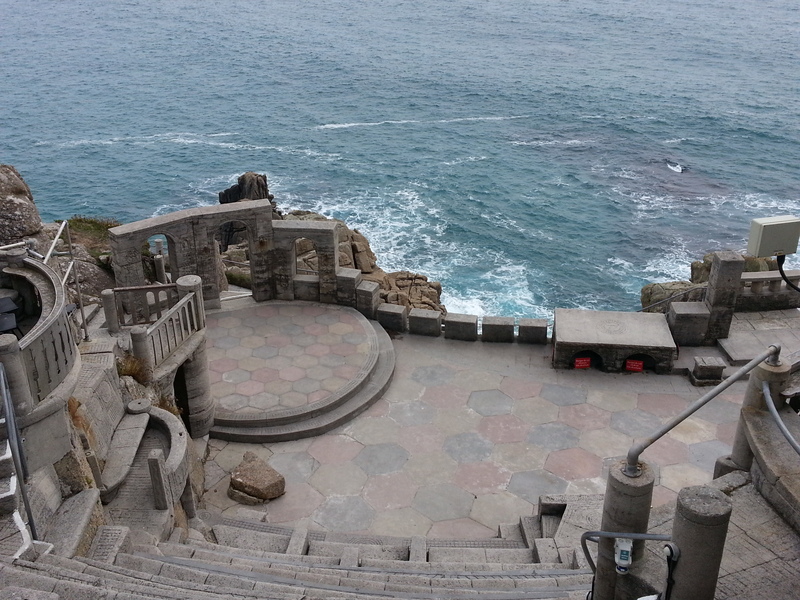 The sea and cliff top is a fabulous backdrop for a theatre, great ambience and history. The stage has the names of Shakespeare plays carved onto the stones. We just sat there for a while, marvelling at her work and admiring the views out to sea. The entrance fee is very reasonable, it only costs £4.50 and the ticket lasts for a whole year, best money ever spent. 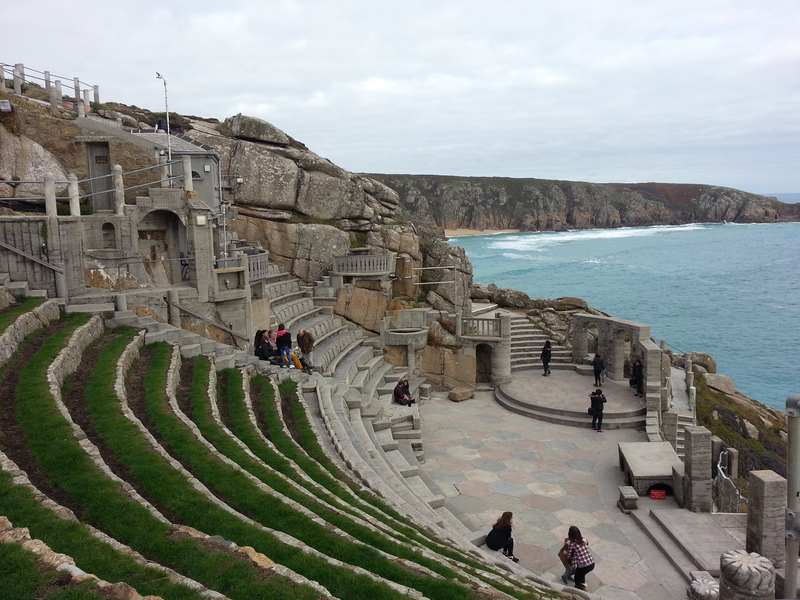 Next door to the entrance of the Minack Theater, there is also a beautiful secluded beach. Access to it is via very steep steps down from the top of the cliff, but don’t let that put you off as it is well worth the effort to get down there. The colour of the water is a stunning emerald green, with the waves bathing the golden sand and crashing over the rocks by the cliff edge. The water was so clear we could see a seal swimming along from up on the cliff, standing our clearly against the pale sand as it swam along searching for lunch, even though well down in the clear water. Dramatic and beautiful. 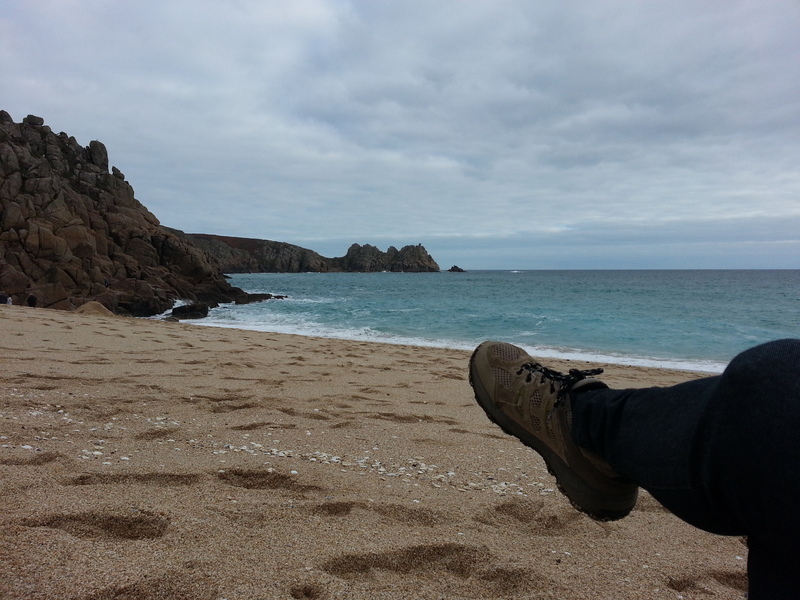 We spent sometime sitting down on the sand and enjoying the tranquillity and beauty of this place, before gathering our strength to walk up the steep cliff back to our car and drive to our last stop of the day. 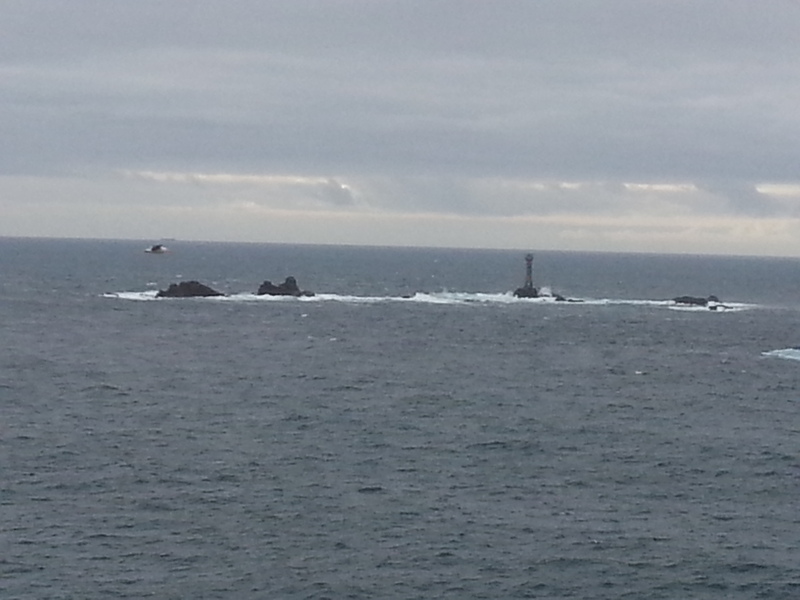 Our last stop of the day was at the most South-Westerly point in main land Britain. 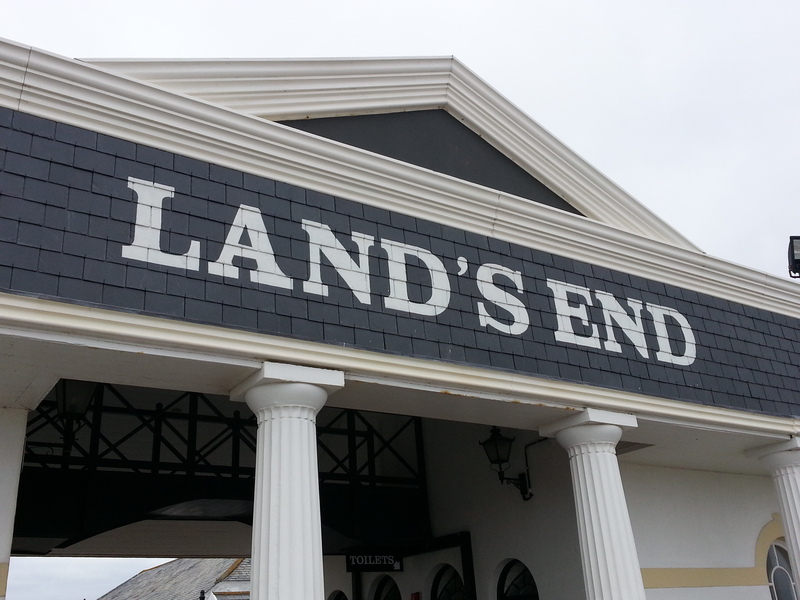 Lands End is a popular land mark, often used for charity events as a starting or finishing point for both walk or cycling challenges from John O’Groats in Scotland, which is 1, 349 km ( 838 miles) by road. It did not disappoint. The car park is pricey and the entrance to the park is very tacky with amusement arcades, shops and rides. But walk through and beyond the main entrance and there are about 100 acres of outstanding natural beauty, with the sea as a backdrop, the Scilly Isles in the distance, and the light house. It is fabulously dramatic, with huge waves crashing onto the rocks well below and you find yourself shivering at the thought of what those wild seas and jagged rocks could and did do to countless hapless mariners across the ages. 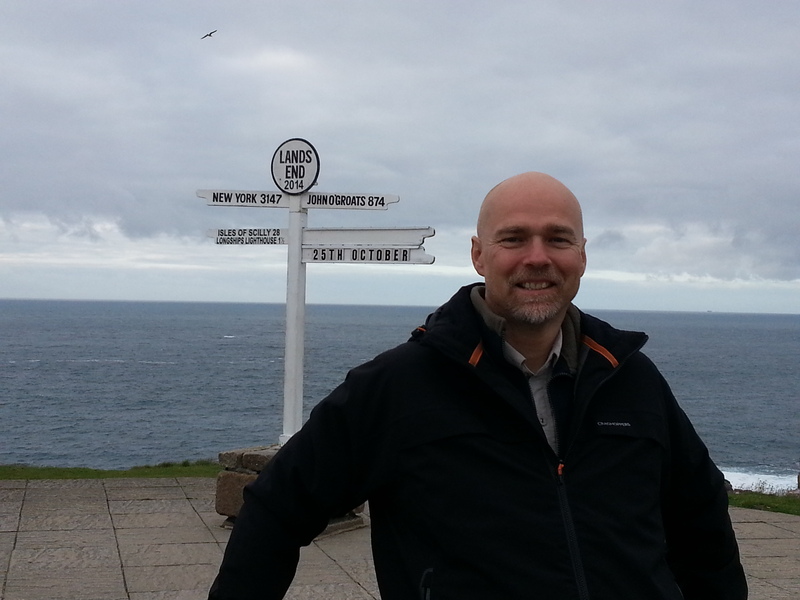 We met a guy there who asked Brian to take his picture in front of the famous sign post land mark – he told us that he had spent the last 2 weeks walking the Coastal Path from Minehead in Somerset. This landmark was the end of his journey and after a quick photo he dashed to the bus stop to catch his bus home. We also decided to have the obligatory photo in front of the sign post (off course), though as always Brian decided not to pay to get his home town put on the sign and just stood in front of it for the cheap and cheerful souvenir version! The evening was fast approaching and we were feeling very tired, so we drove back to our hotel for another lovely dinner and our last night in Cornwall. On Sunday we woke up to a lovely sunny and dry day and after breakfast we checked out of the hotel and headed for the Lizard Point and Cadgwith Cove for another morning of exploring before starting our drive back home. 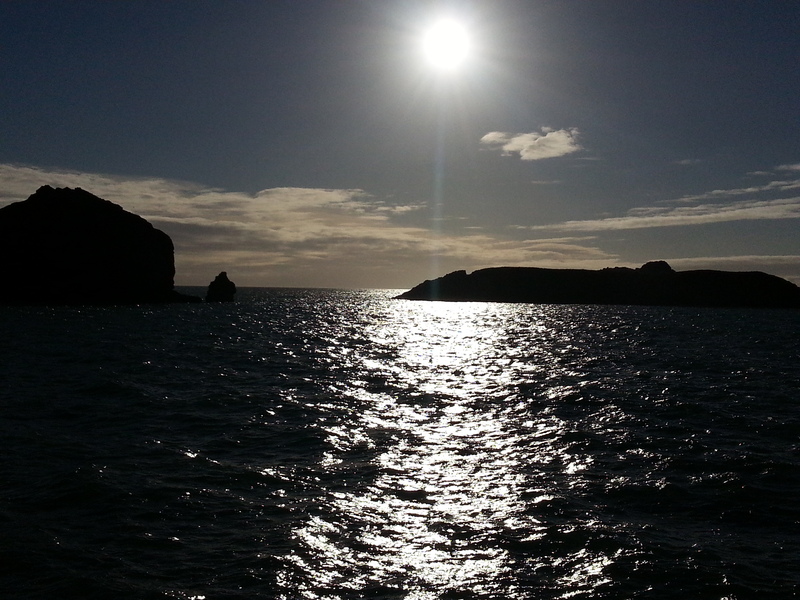 The Lizard Point is a peninsula and the most Southerly part of Britain, and is an area of distinct character. These waters can be very hazardous for ships with many maritime disasters happening in this area so it has became famous as a” shipping graveyard”. The geology is also unique with interesting rock formations and cliffs. As we arrived we noticed people with massive cameras taking pictures of the wild life such as birds and seals. We thought they were just showing off with those massive camera lenses, but later on we discovered that they are in fact part of a project of people who have volunteered to record the wildlife sightings on a daily basis here a the Lizard Point. 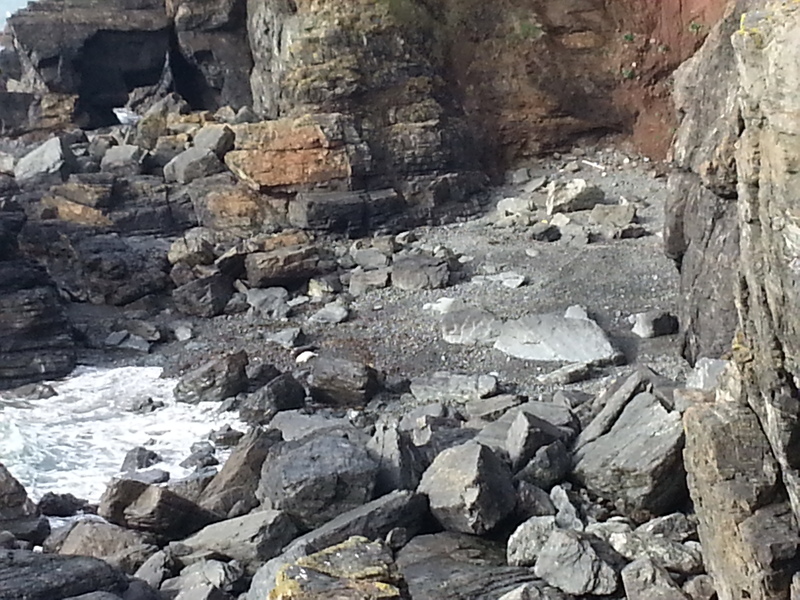 We walked down to the little harbour to see seals frolicking in the water and coming up for air. We watched them for a while fascinated by their playful nature. 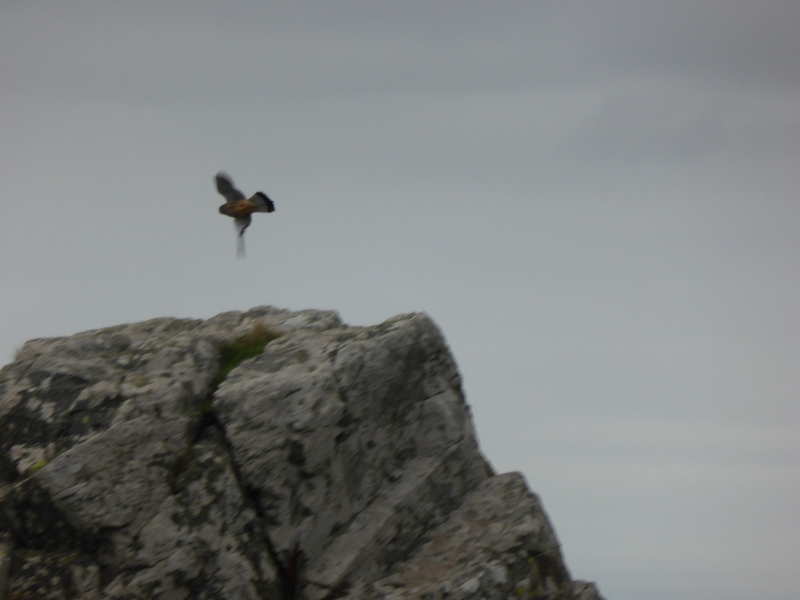 I tried my luck at capturing them on camera, but the lens on my camera phone was not really powerful enough to capture them, as they were so fast at coming up for air and diving down again it was just impossible. The old lifeboat station is no longer in use as the new lifeboat is now housed a mile or so round the coast, and already fierce storms have started tearing the concrete and steel slipway apart. Here it looks a little worse for wear but it is nevertheless full of character and charm. A very atmospheric and dramatic place. Later on we walked over the cliffs and again we spotted a whole family of seals basking in the sand by a very secluded beach – mum and dad seals were grey, but baby seal was very white (so cute). it was so lovely to see them totally relaxed and unaware of our presence and again I wished I had a more powerful camera to catch them in pictures. Can you spot the white baby seal? 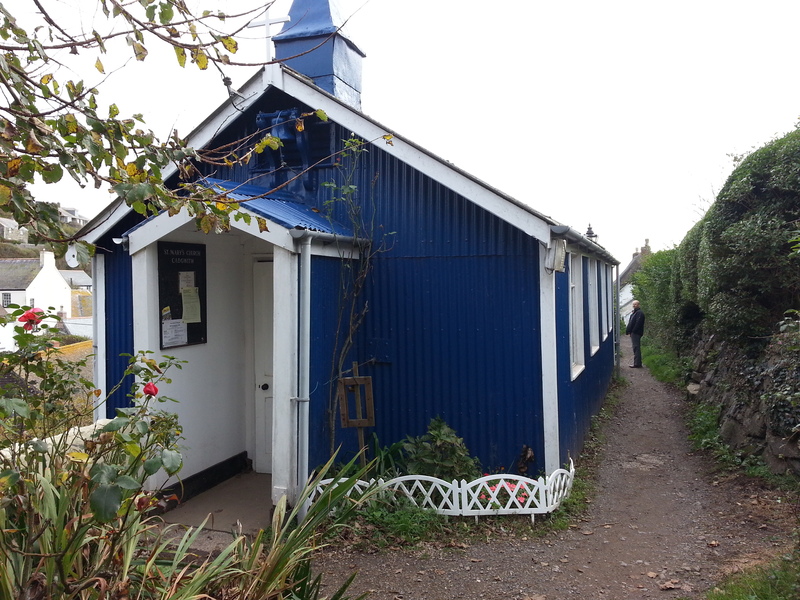 From the car park you can walk through the little path, passing by the little blue church until you reach the village of Cadgwith Cove. 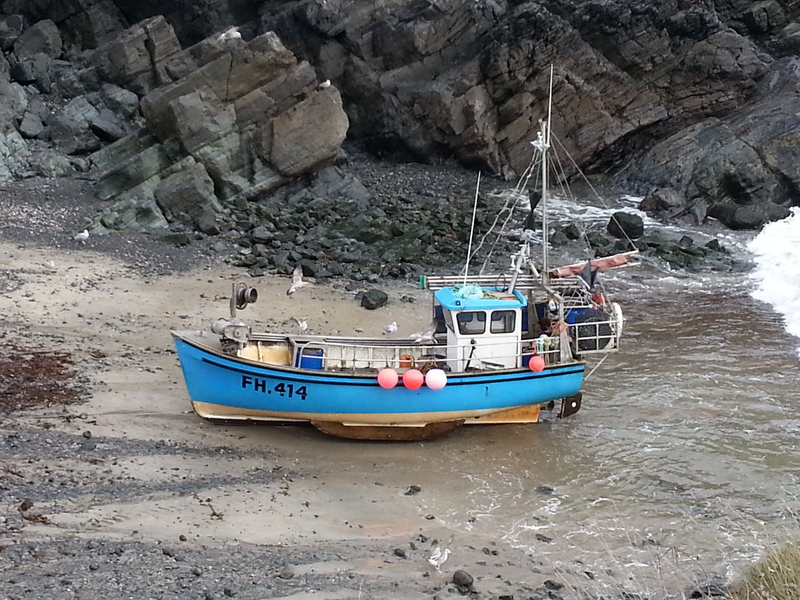 This tiny fishing village, located on the east side of the Lizard Peninsula has a working harbour and the fishermen here still go out every day to catch crab, lobster, mackerel, mullet, shark etc. 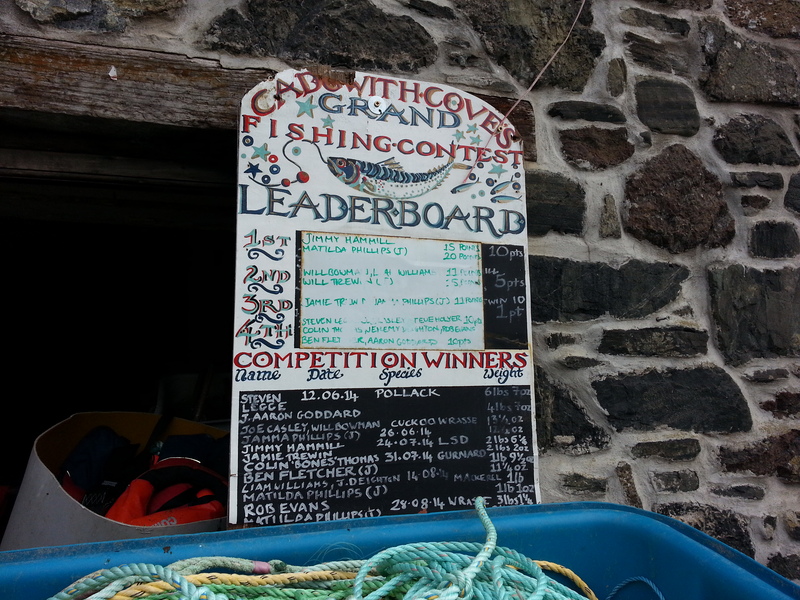 It also caters for the tourist anglers and afterwards they will post their catch of the day at the Leader Board at the harbour and compete with each other for the winning fish. 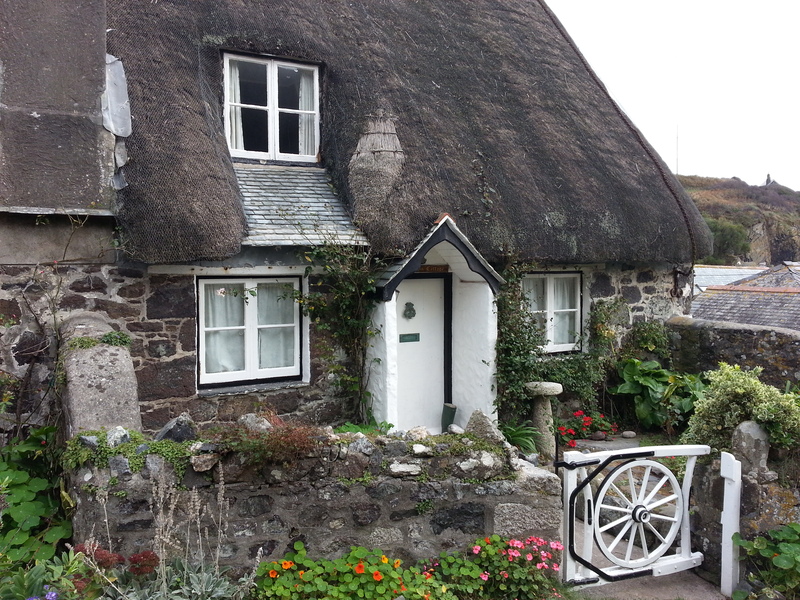 The thatched whitewashed cottages are so charming and fit perfectly in this idyllic coastal village, the cottages are often rented out to tourists that want to have a taste of this charming place. 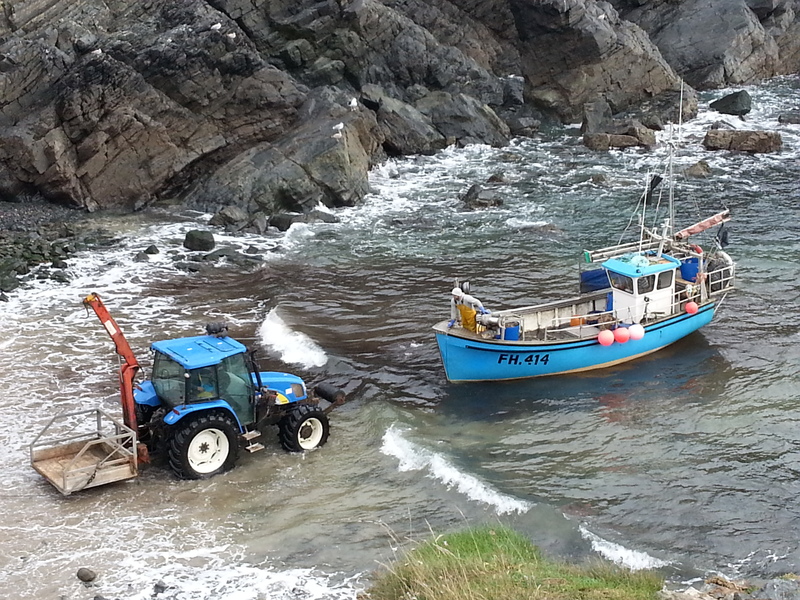 We spent some time watching the arrival of a fishing boat and how it was pulled in by a tractor at the mouth of the harbour. Seagulls going crazy flying over and around the fishing boat and trying to eat an easy catch. We thought of having lunch at the harbour, perhaps a nice crab or a lobster, but opted for a cream tea instead and found a lovely place by the harbour. Cream Tea is a form of afternoon tea or light meal consisting of a pot of tea taken with a combination of home made scones, clotted cream and jam. Traditionally a speciality of Cornwall and Devon, the exact origin of cream tea is still disputed by both Counties! The scones were deliciously warm and combined with the harbour setting it was a perfect afternoon meal. 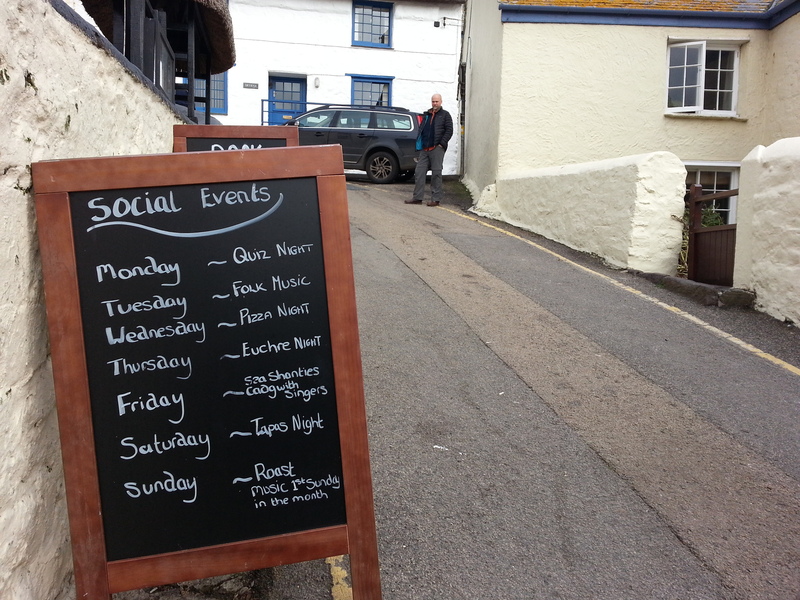 The social centre of the village is the local pub, the Cadgwith Cove Inn, but unfortunately we could not hang around and socialize, since we had a long drive home. After another walk around the village and up into the cliff top, and it was time to say goodbye to Cornwall and its charming little fishing villages, lovely moorland landscapes, impressive cliff tops, rugged coastline and amazing section of the South Coastal Path. We absolutely loved our busy weekend of sightseeing in beautiful Cornwall, blown away by the dramatic coastline, and can’t wait to return. 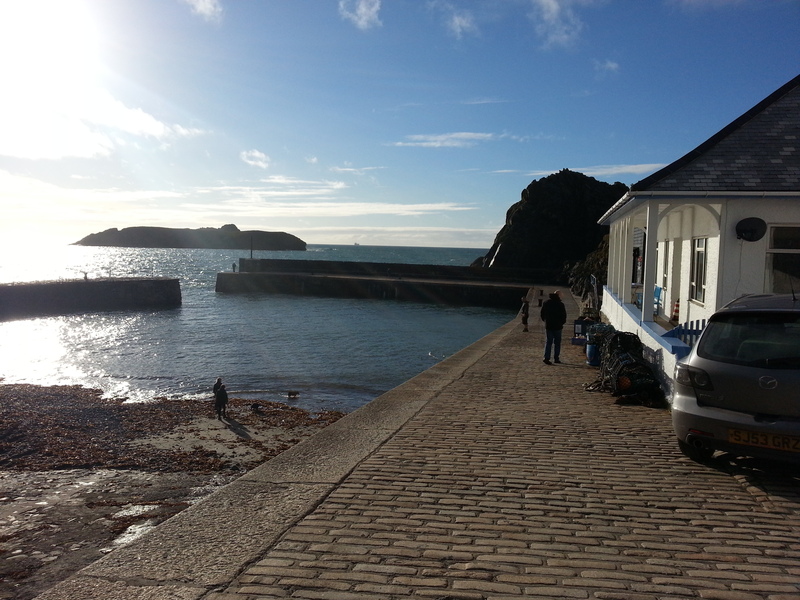 I remember Mullion – I went on several holidays around that area when I was a kid and have happy memories of stunning cornish beaches, pasties and ice-cream! I have a friend in Devon too and I love to visit her, the scenery in that part of the country is so beautiful, as you’ve managed to capture in this post. 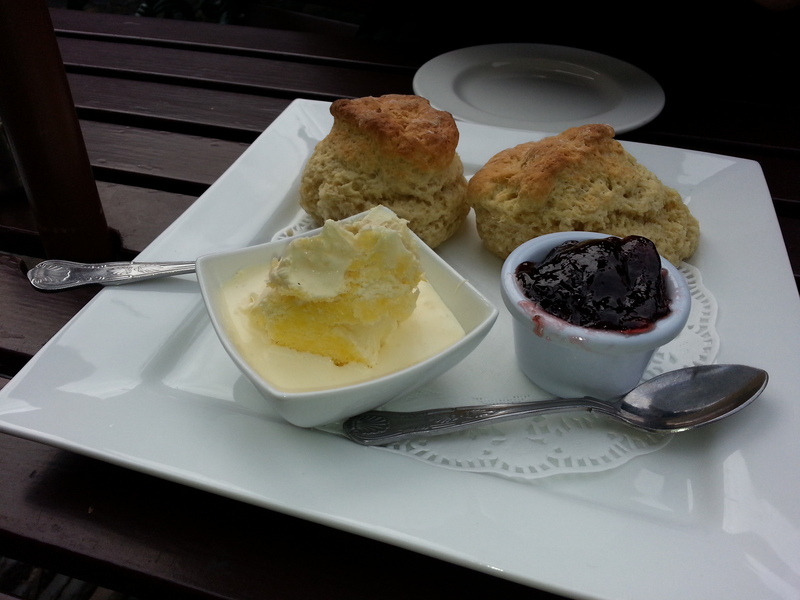 It looks like you had an amazing weekend, that picture of the cream tea made my mouth water! Hi Amy, Cornwall and Devon are very beautiful counties and combined with the milder climate it is very appealing. We live in Dorset, so it’s not too far for us to travel to on a long weekend break. That cream tea was very yummy. Happy New Year to you both. 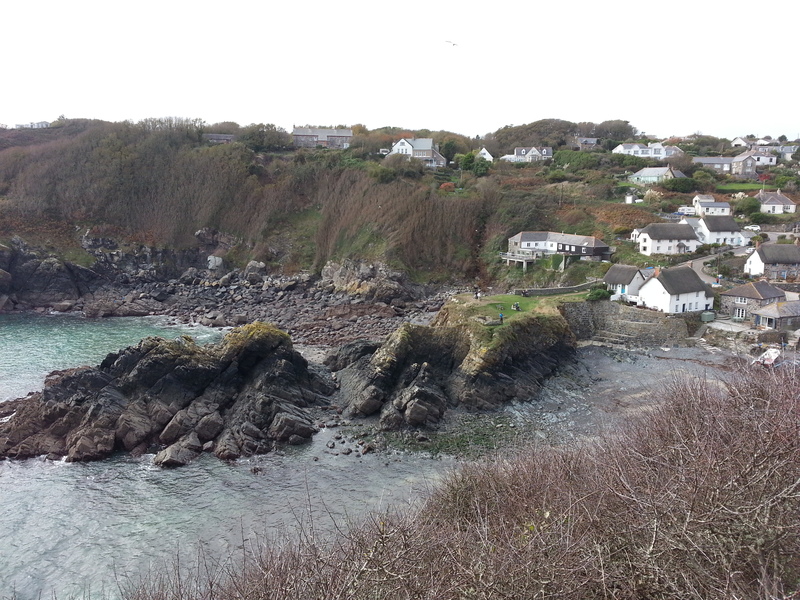 Hi Val, it is such a stunning coastline, you and Paul would love this part of the coastal path. You also have inspired me to do the Camino de Santiago. 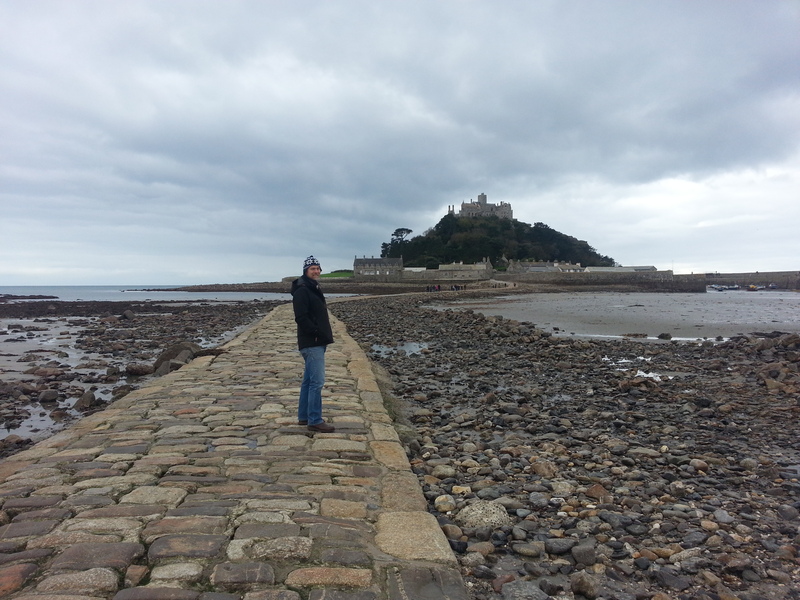 Hi Pati, your friend is a lucky person, St. Michael’s Mount is beautiful. 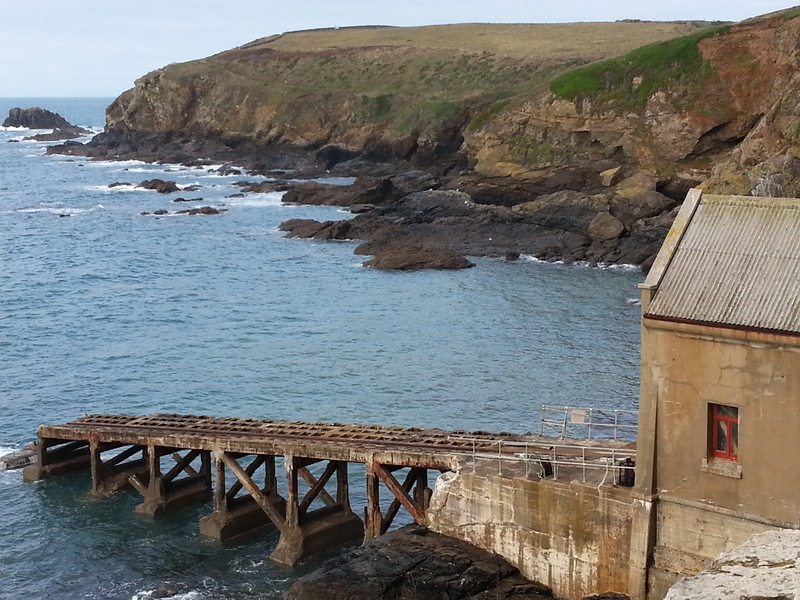 We want to visit again soon and walk more of the Coastal Path, maybe next time we will stay at Christine’s B&B. Thanks for your comment Pati. Lindas fotos sister!!! A Inglaterra é sem duvida um lindo país, cheio de lugares maravilhosos. Certamente um belo presente de aniver que vc soube aproveitar… adorei e fiquei louca pra conhecer! Na sua proxima visita temos que planejar conhecer mais coisas aqui na Inglaterra, tem lugares lindos mesmo. Obrigada sister por ler o meu blog e comentar.